Ahriman's Prophecy Game Review - Download and Play Free Version! Ahriman's Prophecy is one of the finest freeware RPGs ever created. The adventure spans several distant lands and is addicting as all get out. Fans of the classic Dragon Warrior, Final Fantasy and other original Nintendo 8 bit RPGs will quickly fall in love with this game. Ahriman's Prophecy is a beautiful fantasy world doomed to be destroyed by the demon, Ahriman. In a desperate attempt to stop the prophecy, the Daughters of Light send you, a young but powerful magic wielder, on a difficult quest to unlock the secrets of the prophecy and hopefully, learn how to stop it. You can find several other characters to join you on your quest, each with their own abilities and weapon options to help your party. Find magic wielders, warriors, thieves and others to help you on your joing. Find special items to travel to new lands to track down and destroy Ahriman! Talia Maurva is a young girl who finds herself in the unlikely position of having to battle evil and save the world in the role-playing game (RPG) known as Ahriman's Prophecy. 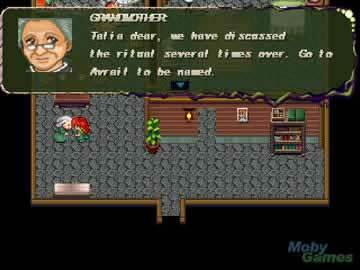 This game is the prequel to the first Aveyond game, and very similar in gameplay. You take control of Talia as you explore the world completing challenging quests and battling deadly enemies. You can hack at enemies with weapons like swords and daggers, or use magical spells to blast them to pieces. There are optional side quests to do as well that can even influence how good or evil your character is. This game might not bring anything new or revolutionary when it comes to RPG gameplay, but it's still a great game. Ahriman's Prophecy contains all the necessary elements to make a great RPG. You start off with an introduction to the story and a few small hints on controls, and then jump right into the action. The story plays a central role in the game from the start and drives your exploration. 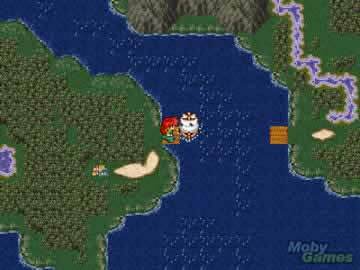 You travel throughout towns and forests as you progress through the game. You can find bags of money and boxes of treasure hidden around the world, often guarded by dangerous enemies. You take on enemies in real-time combat that has you mashing keys as hard and as fast as possible. You have several options when battling, from using melee weapons to magical spells and items. As you advance through the story you can gain allies that will join your party and aid you in battle. It won't be long before you're taking on a large group of fierce enemies with your own group of heroes. You'll be able to collect and purchase stronger armor and weapons, as well as learn more powerful magical spells. Many of the core elements that make RPGs great are in this game. The one downside for serious RPG fanatics may be the lack of customization or control in this game. You are placed in control of various characters and don't really have many options to customize or change them (beyond their armor/weapons). Some players may prefer the level of customization and control that other games offer where you can change almost anything. One possible downside to the game is the level of difficulty. The enemies you face quickly become a tough challenge, and if you're not careful you can easily and frequently die. You may also need to spend some time fighting weaker enemies until you level or gain new items. The controls for the game are relatively simple and straightforward. Combat, moving and interactions can all be accomplished with the keyboard. Additionally, there are a helpful hints to teach you the basics of the game. The graphics in the game are fairly simple and 2D. However, it doesn't really hurt the game or detract from the gameplay at all. 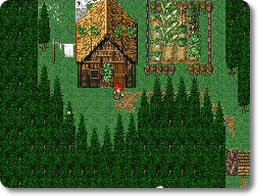 The graphics are also similar to those of many other RPGs. Similarly, combat animations are fairly limited and not all that exciting, but it's not a huge issue. The sound effects and music are both great additions to the game that add to the atmosphere and help draw you into the game. Ahriman's Prophecy is an addictive and entertaining RPG that's excellent for any fan of the Averyond series or players looking for a simpler or easier RPG experience. The story isn't too original, but is still interesting and a nice addition. This game does well when it comes to the basics of an RPG as you explore various locations, complete quests, and battle deadly enemies. You can recruit other characters to join your party and aid you in your quest. Helpful hints teach you the basics before you jump into the action. When you consider that this game is also completely free, there's no reason not to download it. Take a peak at this short video of the rpg, Ahriman's Prophecy.